Russian President Dmitry Medvedev said on Sunday that young generations must prevent new global conflicts and work on ensuring peace and cooperation between countries, RIA-Novosti reported. Russian Su-25 fighter jets paint Russian flag over St. Basil's cathedral during the Victory Day parade in Moscow on May 9, 2010. Medvedev addressed the guests of an official reception at the Kremlin dedicated to the celebrations of the 65th anniversary of the Allied victory in the World War II, which is referred to in Russia as the Great Patriotic War. "The Great Victory teaches us to preserve peace...The duty of the modern generation is to prevent new global conflicts and apply all possible efforts to make good-heartedness, cooperation, and good neighborliness the only possible foundation of relations between countries," the Russian president said. 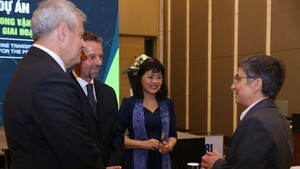 The reception was attended by 21 foreign leaders, including Chinese President Hu Jintao, German Chancellor Angela Merkel and the heads of state of almost all the ex-Soviet nations. 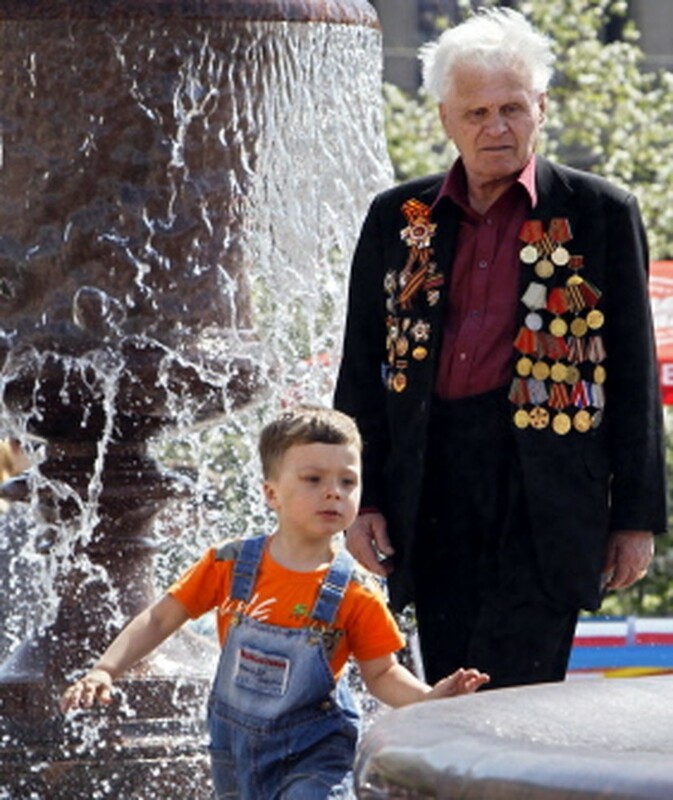 Medvedev expressed gratitude to WWII veterans for their heroism and enormous effort that preserved the freedom and the sovereignty of the Russian people. 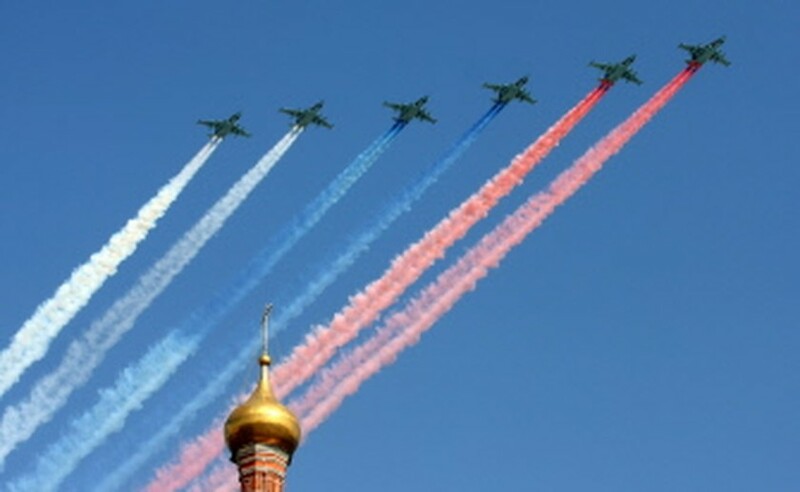 Russia is celebrating on Sunday the 65th anniversary of victory over Nazi Germany in World War II, referred to as the Great Patriotic War in former Soviet states, with a grandiose military parade on Red Square. The parade involves a procession of military personnel from all branches of the Russian Armed Forces, guest units from nine CIS countries, the United States, Great Britain, France and Poland, and a large military orchestra, followed by displays of military hardware and a flyover by combat aircraft. Over 10,500 servicemen and more than 150 pieces of land-based military equipment are taking part in the Moscow parade. A total of 165 combat aircraft will fly over Red Square, with some of them grouping to form the number 65. 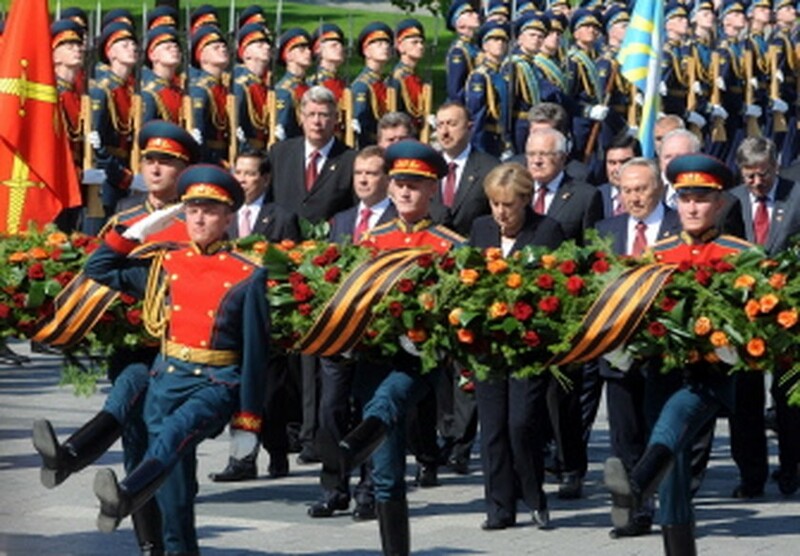 Russian President Dmitry Medvedev, German Chancellor Angela Merkel and other heads of state participate in a wreath-laying ceremony at the Tomb of the Unknown Soldier in Moscow on May 9, 2010. 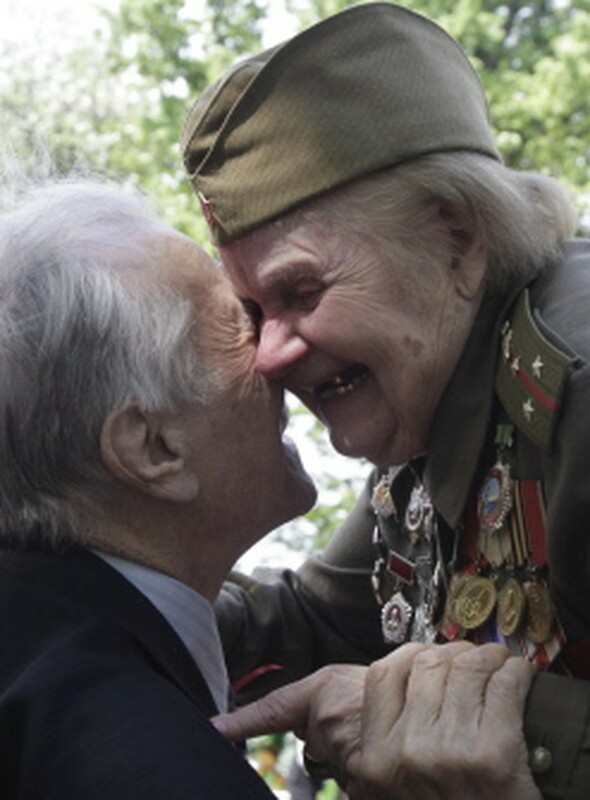 Russian WWII veterans smile and embrace while celebrating the 65th anniversary of Victory Day in Moscow on May 9, 2010. 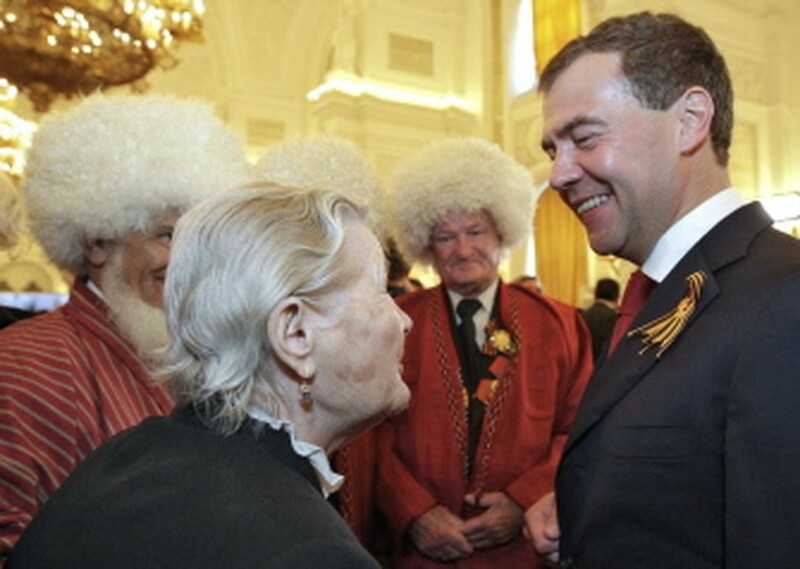 Russian President Dmitry Medvedev (R) speaks with WWII veterans during a reception at the Kremlin after the Victory Day parade in Moscow on May 9, 2010. 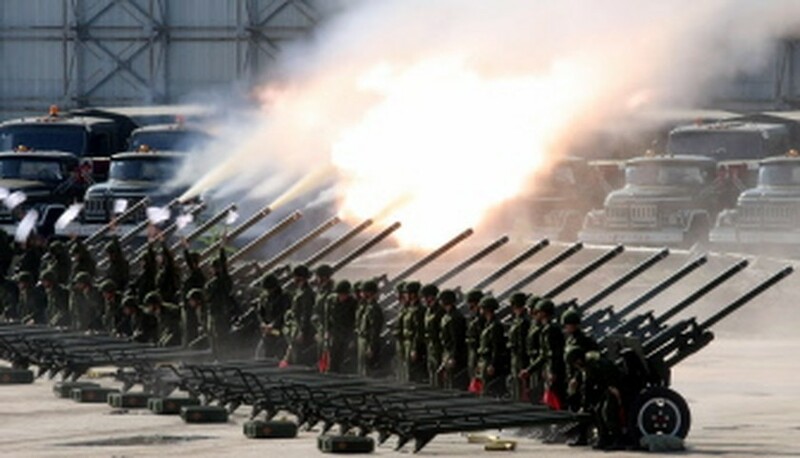 Russian howitzers fire a salute during the Victory Day parade in Moscow on May 9, 2010.